This is technically a Halloween book but since it's about pumpkin pies (which I associate with Thanksgiving), I read it in-between. It was a cute enough read, but nothing memorable or great. The illustrations made me think of the Gooseberry Patch catalog (cutesy country cozy stuff) and there were lots of cats, so I enjoyed that! The story is a bit long, and the poem is awkward--I hate to say it, but it seemed a bit amateurish. Still, it's a "gentle" Halloween read for those not too keen on the scary stuff. I picked up this book and chose it for my daughter's first introduction to Witches and Halloween after reading a handful of other Halloween books while at Barnes and Noble almost two years ago. I absolutely loved how good-natured and positive the entire book was. The good morals (view spoiler)[("But who cares how kooky someone looks, when there's goodness deep within") (hide spoiler)], the innocent way that Halloween was written in the story, and the illustrations were visually stimulating in a pleasing manner; very reminiscent of the simple rustic country art I used to love seeing in small towns as a child. I loved being able to find such a little gem as this book for my daughter, and it's actually my 19 month old's favorite book that she gets us to read to her every night! I picked this up because I have LOVED the books I've read written byMark Kimball Moulton. His bookReindeer Christmas is a book that we plan on purchasing to read at Christmas every year. If you haven't read that book, you absolutely must pick it up this Christmas!Moulton has written several books and I've enjoyed them all. His rhyming style is so easy to read. This only reason this one gets 4 stars instead of 5 is because I did stumble over a few of the rhymes in this book. Generally his words flow so easily. His books have actually made me more critical of other rhyming books that have to restructure a sentence in a weird way in order to make it rhyme.The illustrations in his books are always beautiful as well. I love the style - a cozy country soft feel. My daughter and I liked to count the pumpkins and/or cats on the page.The story was about a lady that a lot of people think are a witch. But every Halloween she makes delicious pumpkin pies that she gives to all the kids in the neighborhood at midnight. It's a sweet story and a great read for those who don't love the "scary" part of Halloween.If you haven't read any books by Moulton, I highly recommend that you pick some up. I'd suggest starting withReindeer Christmas andScarecrow Pete. Such a delightful, October read.Full of clever storytelling and illustrations to match, this is an absolute must-read story for the pumpkin season.This would be great in a secondary classroom to teach students how to build suspense in their writing - as well as how to create illustrations that capture the mood of the piece. 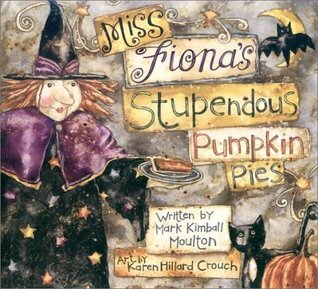 Written by Mark Kimball Moulton, this book was always a Halloween favorite. Written in rhyme, the story carries the scary Halloween tone that is fun and not too scary for younger children. The color palette by Karen Hillard Crouch sets the tone..nice fall colors..lots of oranges and browns, pumpkins and night stars, witches with warts and a recipe for pie that you won't want to follow! This book was definitely too old for my 2.5 year old. We'll have to come back to it maybe next year (or the year afterward), since it's just too long. Still, in the story she grew her pumpkins, made them into pies, and had all the neighborhood children over for pumpkin pie and apple cider. Sweet! I read this with my 7, 4.5 and 3 year olds. The 4.5 was completely enthralled with it. Love the verse structure used and I truly enjoyed the muted colors used in the illustrations-very much fits the season and tone. I enjoyed the message/moral added in. 28 months - we always enjoy a good Halloween read. This is a pretty long rhyming story but luckily O has a great attention span. The rhyme is a bit ackward in places. The illustrations are a bit country-ish but I like the old foxing look to the pages. A cute, non-scary book about a "witch" who makes homemade pumpkin pie from scratch every Halloween to serve to the trick or treaters at midnight. At great honor, one special child is chosen to help serve the pie every year. Beautiful illustrations. I loved this book. It had a really sweet moral to the story. That even though Miss Fiona doesn't look all that great on the outside, it's what is inside that counts. The rhyme is sweet and easy and my girls loved hearing the story throughout October. This was a nice read for Halloween. The witch makes the best pumpkin pie in the neighborhood once a year for Halloween night. This was a rhyming text, so technically it could be called poetry as well. It was a fun book. I liked it. Great book to read for Halloween, Liam loved it! I was alittle upset that Fiona had to be in her 400's, but feel the stringy hair may be justified! I will make that hair appointment.I have only managed 2 Pumpkin pies so far this year. Thanks to our friends in Boston for sending this book! Miss Fiona makes pumpkins pies for her trick or treaters each Halloween. The story is told in rhyme and the illustrations are very homey. A great book for kids at Halloween that not only is a fun read but reminds us not to judge others by the the way the look. Really sweet children's book that I read to some seniors at a nursing home. The story line is fun for Halloween and the illustrations are marvelous. One of our favorites Halloween books. Personally, I think the illustrations leave a bit to be desired, but the story is clever and humorous. What an adorable book! I love rhyming books, and the author does a great job without any missteps in meter. A cute Halloween story. This is a fun book, I would recommend it to all. Told in rhyme and illustrated in lovely earthy colors with sparkly jewel toned accents. It was an ok Halloween book. Slightly weird and just a pinch of creepy. Darling illustrations. Cute Halloween themed story. Miss Fiona loves pumpkins, pies and children. The story is in rhyming form and the artwork is beautiful and inviting. Rhyming Halloween story. A friendly baking witch;) I thought it was cute and am happy to add it to our Halloween book collection. I read through this book at the bookstore today and brought it home to read to my boys. It is super cute! I love the rhyming, fun text and cool illustrations. Great halloween book! I own a hardcover of this and it's absolutely beautiful. I love the illustrations, they really evoke a great fall/Halloween feeling. Cute rhymes. AND it makes me incredibly hungry for pumpkin pie.